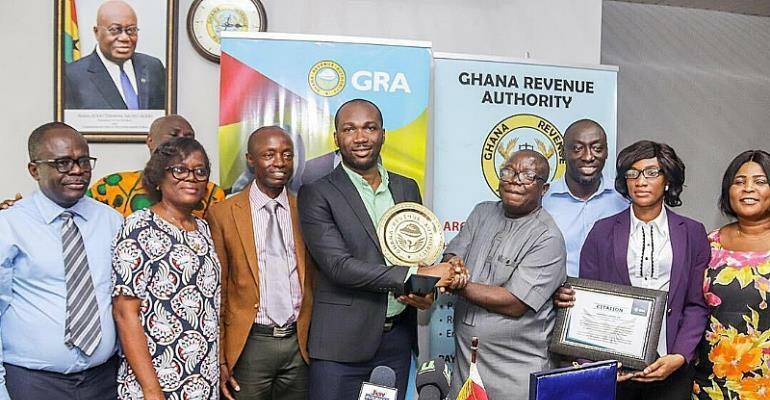 Kasapreko Company Limited (KCL), Ghana's trusted beverage manufacturing company, has been recognised the Best Indigenous Tax Compliance Company for 2018 by the Ghana Revenue Authority (GRA). The award is in recognition of KCL's commitment to filing their tax returns and compliance to tax laws which has immensely contributed to national development. Presenting the awards to KCL on behalf of the Commissioner General of the GRA - Kofi Nti, Deputy Commissioner at the Large Taxpayer Office of the GRA, Edwin Gyambrah touted the only local beverage manufacturing company with ISO Certification in Ghana as most tax compliance local company. He disclosed that KCL paid a total tax of GHC85.4 million in 2018 representing an increment of 8.5 percent in 2017. The Deputy Commissioner noted that the award is to ensure Kasapreko Company Limited becomes the role model for other indigenous companies to encourage them perform their tax obligations to the government. "We've seen that your compliance rate in terms of your date of filing, regular payment of your cooperate tax, employee taxes and your excise duties have been very good and as a result, the GRA appreciates this and wants to use you as a model to other local businesses that we don't just collect taxes but we also appreciate things that are done by businesses," he stressed. He said, one of the key objectives of the KCL over the past years, is to be a company that other businesses look up to in Ghana not only as the best brand in marketing and sales or Corporate Social Responsibilities but also for paying the required taxes. "We're very glad that GRA has recognised our hard work and contribution to the economy as a whole. We hope that this will be an encouragement to other local companies to follow," Mr. Adjei said. He urged the GRA to continue to enforce its laws to enable other companies that are not in compliance follow the law in order to create a fairly competitive landscape for those companies that are complying and paying the right amount of taxes. Mr. Adjei further called on the government to also provide some form of tax relief to the KCL as a form of appreciation in addition to the award to enable the company embark on other job creation ventures which will ensure more taxes are paid. He, therefore, called on the government to offer some support in the form of reduced tax rates to enable the company expand. "We're certainly glad that we're being recognised as the best Indigenous Taxpayer and we hope that the government will also take this opportunity to sometimes give us tax rates to show their appreciation for what Kasapreko is also doing. "We're building a new company at Tanoso in Kumasi and we've rightly applied for the 1-district, 1-factory and we're looking forward to the support that the government will give us as we expand. The more support we get will obviously mean the more taxes we'll pay. We hope that as we've been recognised, the government will also put in place policies to support not only us but the local companies in general," he appealed. "You are a certified Ghanaian indigenous manufacturer and producer of alcoholic and non-alcoholic drinks established in 1989. Over the years you have contributed immensely to national development through the payment of various tax types. Your contribution to revenue in 2018 was impressive. You have shown growth across all tax types over the years. You increased your 2018 tax payment by 8.5% over that of 2017. You have also shown tremendous improvement in the filing of tax returns. For this admirable consistency in improvement in revenue growth, the Ghana Revenue Authority presents to you, Kasapreko Company LTD the Most Indigenous Company compliant with tax laws for the Large Taxpayer Office".